Buenos Aires is not too hard of a city to get around in, but all too often the public transit gets crowded, and you find yourself up close and personal with all 8 million of its inhabitants who are moving around the city at 5 in the afternoon. The best way to avoid all that traffic is with your own means of propulsion. Traveling by car will take forever because of the narrow streets with few lanes and all of the stoplights. A motorcycle is efficient, but not everyone has a moto license and the money to rent/buy one. The bicycle is the most economic and time-efficient way to get around the city. With several options for rent, lots of deals on used bikes in shops all around town, and government sponsored bike stations, Buenos Aires is slowly becoming a bike haven. Many people talk trash about biking down town, saying it is dangerous, that all the drivers are out to kill pedestrians and bikers, and that it is a slow way to get around town. Biking can be dangerous if you do not know how to ride a bike, but it is by far faster than a car or subway, and the motorists are rather tame as long as you make yourself present and are willing to share the road. If you do not know how to ride a bike or do not feel comfortable with riding in a high traffic area, do not worry, there are still some options for you! Plaza Holanda is a park located in Palermo that is a pedestrian paradise with a big circular path and road that is just under 2 kilometers. It features a pedestrians and bikes only side and a road with very little traffic just outside. They rent bikes here, so this could be a great place to try your skills out or get them tuned in to go hit the streets. From Plaza Holanda, you can get on one of several bike paths (¨Bicisenda¨) that stretch out into all directions of the city. These bicisendas are a safe way to get just about anywhere in town without having to worry about getting hit by an oblivious taxi driver. Scattered along these bike baths are stations for renting bikes at no cost. 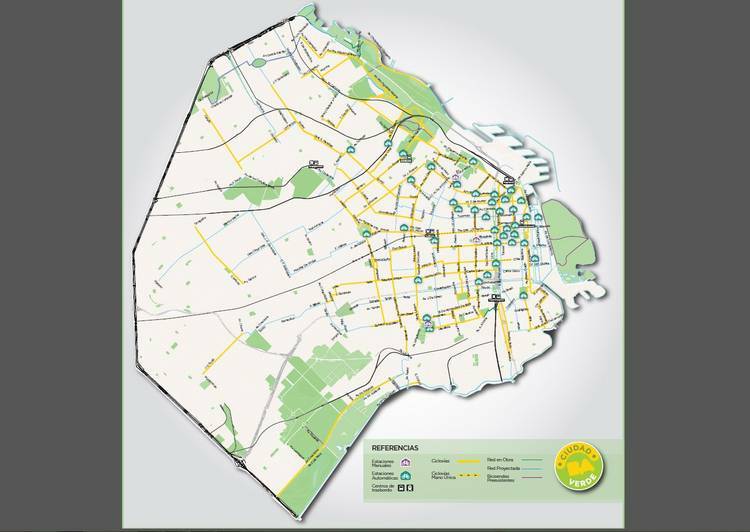 For more information about how to get a bike and maps of all the bike lanes, check out this link from the city government. If you do decide to get off the bike lanes and into the streets, here are a few pointers to stay safe and get around quicker. 1 Wear a helmet. Even if you stay on the bike lanes, you should definitely use a brain bucket. 2 Keep your head on the swivel. Always know your surroundings and be aware that buses have huge blind spots and are most likely presuming that you are going to yield to them and not the other way around. Pedestrians and motorcycles crossing during stop and go traffic can come unexpectedly. If you are passing by all the cars stuck in stop and go traffic, don´t let your guard down, maybe it´s too good to be true. 3 Make yourself present and be confident. If you feel confidant and present, you will be more likely to be noticed and respected by other motorists. Here in Buenos Aires everyone is pretty good about respecting each other on the streets.... except for the taxi drivers, watch out for them. They are less likely to notice you and less likely to yield any space. Also, they cross the road much slower than other cars because they are looking for fairs. 4 Try to get on a one-way road, and go to the left. If you are on a bigger avenue, the left lane is generally for people on motorcycles and bicyclists. 9 de Julio is an exception. Try to stay on the right there. It can be more intimidating to stray away from the bike paths, but you can get around the town much faster. Corrientes goes from the Palermo area to the city center, and Córdoba goes the opposite direction from the center westward. 9 de Julio goes north/south in the downtown area, but it can be somewhat congested during peak traffic hours. Going to a street parallel to 9 de Julio during peak hours will be a small sacrifice in time for a big increase in safety. 5 Have fun! Weaving in and out of traffic can be a blast. Going around the city on a bike is exhilarating and is the best way to cover a lot of ground in a day.